True Story- One of our local police officers stopped by early this week with this group of assorted gold items she owned and wanted to sell– jewelry she no longer wore, broken pieces, etc. We sat down, I examined her gold for karat content and weighed it up. Our offer for the lot that day was a little over $1000. Then she told me that she would be attending a “gold party” at a friend's home later in the week. This was one of those “sponsored” events where the homeowner/party thrower invites friends and family to their home to visit a professional buyer and gets 10% of the take. I told her to go to the party and see what price her gold would bring, and please, to come back and let me know what they offered– I knew my offer would be more, but wanted to see by how much. Sure enough, this afternoon, my police officer was back with gold in hand. The party company had offered her about $600 for the gold that I was willing to buy for $1000! We offered 60% more! And happy to do so! The actual transaction with our officer was for about $920 because she kept several items out of the lot, but she was very pleased with her check. We know she will be a return customer. For us, it's off to the refiner a little sooner! Personally, I think these companies are really greedy and are taking advantage of their customers' lack of knowledge. In today's economic environment, it's very easy to sell your gold because there are so many buyers– but remember, many pay you the lowest price possible. Before you sell you gold, educate yourself! Please, read my blog, How to Get the Best Price for Your Gold, Again. Whether we buy your gold or not, the information in the blog will help you get good value for your gold. We respect our customers and always pay a fair price– in fact, we've set up a FREE easy-to-use Scrap Gold Calculator right here on our website that will help you establish the value of your gold. Please use the calculator before you go to the gold party, before you see the gold buyer who floods the newspaper with full page ads and sets up for the weekend in a local hotel, before you send your gold to the Cash4Gold guy on TV. And if you just can't figure it out, stop by the shop–we are happy to weigh and value your gold for you, free of charge. 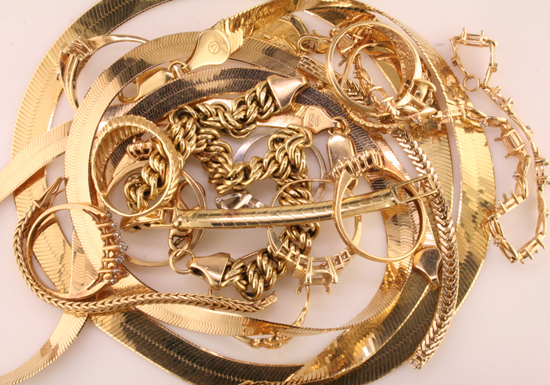 As longtime members of our community, we are here to be of service, whether it's to appraise your jewelry for insurance, estate value, or liquidation, to purchase your gold for recycling, or to purchase your estate jewelry. Remember, we'll be here long after the gold parties and the roving gold buyeres have moved on! This entry was posted on Saturday, January 9th, 2010 at 6:25 pm	and is filed under Gem Industry News, Jewelry Facts, Jewelry Services, Mardon Happenings. You can follow any responses to this entry through the RSS 2.0 feed. Both comments and pings are currently closed.